How to access, add or delete shared links in Safari on iPhone or iPad? Just read this post to get the detailed information. This all-around iPhone/iPad/iPod content transfer tool can let you have a better management of your important data. You can download it to have a try after reading this guide. Sometimes, you may only want to see the links shared from some technology or news accounts that you are interested instead of crowded contents shared by your friends. Actually, you can easily access only the shared links in Safari if your iDevice running on iOS 7 and later. In other words, you can use it as news reader with this feature. Let's start to see how you can access it. Step 1. Open Safari on your iPhone or iPad. Step 2. Tap on Bookmarks icon. Step 3. Tap on @ icon and you will see all the links shared by Twitter accounts that you are following. If you want to add one account to shared links, you can: Go to Safari > Tap Bookmarks button > Tap @ > Find the installed social media apps that can be added > Turn it on > Tap Done. If you want to delete one subscription from shared links, you can: Open Safari > Tap Bookmarks button > Tap @ > Tap subscriptions > Tap the delete button > Tap Delete. Like many iPhone, iPad or iPod users, you may always use iTunes to manage your important data, but don’t you think it is kind of complicated and time-consuming when using this program? What’s worse, it will not allow you to transfer any files from your iPhone to computer with it. 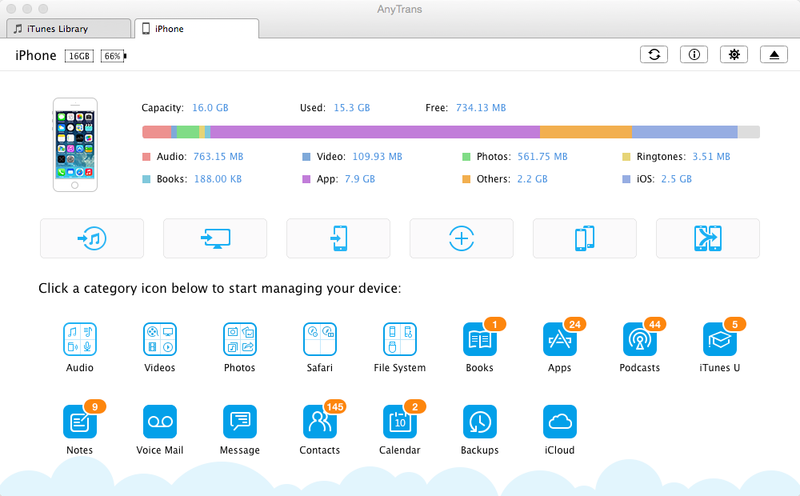 If you prefer one easier way to manage your iDevice, one professional iOS data transfer tool named AnyTrans can be your best choice. Why? 1. It supports managing music, photos, videos, contacts, messages, notes, Safari bookmarks, apps etc. 2. It can let you transfer most of the important data from iDevice to iDevice, iDevice to computer/iTunes and vice versa. Hope this guide can help you solve some Safari shared links related problems. If you are interested in AnyTrans, just click here to have a 7-day free trial!